Implementing business rules as well as performing validation or data modifications, triggers are the best use for this purpose when other methods are not sufficient. Triggers are normally used in two areas: creating audit records and reflecting changes to crucial business tables, and validating changes against a set of business rules coded in T-SQL. In this article, I would like to demonstrate how to create triggers, use of triggers, different types of triggers and performance considerations. A database trigger is a stored procedure that is invoked automatically when a predefined event occurs. Database triggers enable DBAs (Data Base Administrators) to create additional relationships between separate databases. In other ways, a trigger can be defined to execute before or after an INSERT, UPDATE, or DELETE operation, either once per modified row, or once per SQL statement. If a trigger event occurs, the trigger's function is called at the appropriate time to handle the event. Triggers can be assigned to tables or views. However, although there are two types of triggers, INSTEAD OF and AFTER, only one type of trigger can be assigned to views. An INSTEAD OF trigger is the one that is usually associated with a view, and runs on an UPDATE action placed on that view. An AFTER trigger fires after a modification action has occurred. From a performance viewpoint, the fewer the triggers, the better, as we will invoke less processes. Therefore, do not think that having one trigger per action to make things modular will not incur performance degradation. 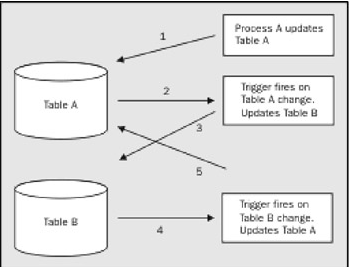 A trigger's main overhead is referencing either two specialist tables that exist in triggers – deleted and inserted or other tables for business rules. Modularizing triggers to make the whole process easier to understand will incur multiple references to these tables, and hence a greater overhead. Note: It is not possible to create a trigger to fire when a data modification occurs in two or more tables. A trigger can be associated only with a single table. We might want to ship a free item to a client with the order, if it totals more than $1000. A trigger will be built to check the order total upon completion of the order, to see if an extra order line needs to be inserted. In a banking scenario, when a request is made to withdraw cash from a cash point, the stored procedure will create a record on the client's statement table for the withdrawal, and the trigger will automatically reduce the balance as required. The trigger may also be the point at which a check is made on the client's balance to verify that there is enough balance to allow the withdrawal. By having a trigger on the statement table, we are secure in the knowledge that any statement entry made, whether withdrawal or deposit, will be validated and processed in one central place. Note: We discuss only data integrity here, and not referential integrity. A stored procedure, A, updates TableA. This fires a trigger from TableA. The defined trigger on TableA updates TableB. TableB has a trigger which fires. This trigger from TableB updates TableA. A trigger is a special kind of stored procedure that automatically executes when an event occurs in the database server. DML triggers execute when a user tries to modify data through a data manipulation language (DML) event. DML events are INSERT, UPDATE, or DELETE statements on a table or view. More details can be found at this link. The CREATE TRIGGER statement defines a trigger in the database. This statement can be embedded in an application program or issued through the use of dynamic SQL statements. It is an executable statement that can be dynamically prepared only if DYNAMICRULES run behavior is in effect for the package (SQLSTATE 42509). If a trigger definer can only create the trigger because the definer has SYSADM authority, the definer is granted explicit DBADM authority for the purpose of creating the trigger. There are three main types of triggers that fire on INSERT, DELETE, or UPDATE actions. Like stored procedures, these can also be encrypted for extra security. More details can be found at this link. The most important point is to keep the trigger as short as possible to execute quickly, just like stored procedures. The longer a trigger takes to fire, the longer the locks will be held on the underlying tables. To this end, we could place cursors within a trigger, but good practice dictates that we don't. Cursors are not the fastest of objects within a database, and we should try and revisit the problem with a different solution, if we feel the need for cursors. One way around the problem may be to run two, or perhaps, three updates, or even use a temporary table instead. Use triggers to enforce business rules, or to complete actions that have either a positive effect on the organization, or if an action will stop problems with the system. An example of this is creation of a trigger that will e-mail a client when an order is about to be shipped, giving details of the order, and so on. Note: Use an @@ROWCOUNT, where required, to check the number of rows that have been affected. I hope that this article might be helpful to you. Enjoy! A well experienced leader with successful track record of software development, product innovations, brand management and corporate communication etc. Some successful product innovations have also achieved and awards “Most Valuable Professional” (MVP) at 2010 and 2011 by codeproject.com and also selected as a mentor of codeproject.com. Published over 100 technical articles in various software development resource sites (i.e., codeprojetc.com, Microsoft MSDN, and IEEE & IBM (In progress)) and various IT Forums, Blogs etc. Over fourteen years of professional experiences in ICT field having extensive experience in formulating corporate vision and long term strategy. Leading development related functions including design, development, services, data management and analytics, customer experience management, content services, digital analytics and optimization.I have also more than two years’ of strong experience in mobile-VAS (platform development). An individual with results-driven approach and relentless in pursuit of excellence from a business and organizational standpoint.Honest, believes in transparency, commitment and teamwork. Expertise: Software/Solution Architect, Technical Research, MIS, Data Analytics, Data Mining, BI, SaaS platform base application development, Large scale Win32 Form/Web based business software solutions, Security, Enterprise applications development, integration, etc. Technologies/Tools: Microsoft.Net, Microsoft SQL Server , Oracle, MySQL, ETL, Visual C#, VB.NET, ASP.NET, , Python, Java, API, MVC, Cloud Computing, SaaS, Open FaaS, AWS,AWS Lambda, MS Azure, WebAPI , WPF, WCF, PHP, Microsoft Power BI, SPSS, PS2, R, Add-In, Visual Basic etc. .Net UI component: Telerik, DevExpress, Ext.Net etc. Source control / Subversion: Git, Smart SVN, Assembla etc. Project Management / Issues Tracking Tools: JIRA, Trello, Slack, Clockingit etc.